Stress and Canker Sores | Are Canker Sores Caused By Stress? Home / All About Dental Disorders / Stress and Canker Sores: Could Stress Be The Cause? It’s easy for one to become very busy in their life between family, jobs, and school sometimes it feels like you don’t even have a second to breathe. Busy lifestyles can often lead to high levels of stress. Stress is common but sometimes tense feelings can cause other medical conditions which puts your health at risk. One medical condition that is often seen in those who often feel stressed is canker sores. Anyone can be affected by canker sores and they are inconvenient and can be painful. They often appear on the outside of the mouth on the lips. Sometimes they are even called stress sores. While it’s not quite understood why people develop canker sores, stress or anxiety may have a role in the cause of these mouth sores. 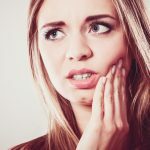 This article will lay out the connection between stress and canker sores and what you can do if you believe your canker sores are caused by stress. Canker sore outbreaks seem related to physical or emotional stress. 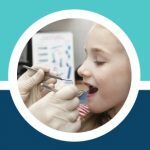 There have been small studies done to look at the role stress, anxiety, and depression play in the development of canker sores or recurrent aphthous stomatitis (RAS), which are canker sores that form often. 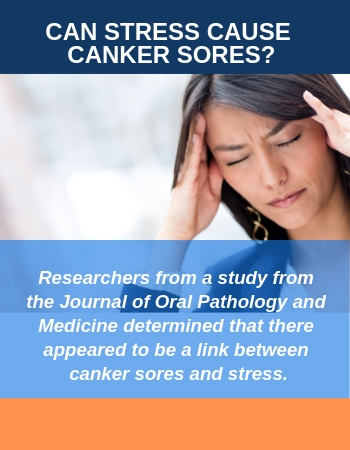 Researchers from a study from the Journal of Oral Pathology and Medicine determined that there appeared to be a link between canker sores and stress. A small study in Contemporary Clinical Dentistry evaluated the psychological profiles and salivary cortisol levels that indicate stress of people with RAS. The researchers were able to conclude that the levels of anxiety and depression were higher in people with recurring canker sores. If you’re experiencing canker sores due to stress or anxiety, learning to manage your stress may be able to help you avoid a flare-up. 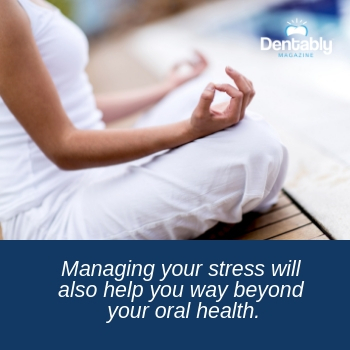 Managing your stress will also help you way beyond your oral health. One way to reduce stress is through deep breathing. If you’re feeling tense deep breaths can help calm you. Along with this, meditation can help ease your mind. Sometimes, you may have a lifestyle that keeps your stress levels consistently high. 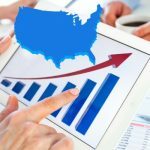 This may call for making lifestyle changes like cutting back on your workload of getting help at home. It’s best to consult a medical professional before you make any major lifestyle changes or if you’re feeling overwhelmed. It’s also important to know how to treat your canker sores when they break out. 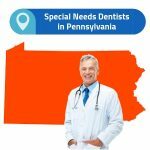 It’s a good idea to call your dentist if you begin getting them more frequently or they become larger than a centimeter. Your dentist can recommend treatments to ease your discomfort. Keep up your daily oral hygiene habits and consider adding mouthwash to your routine. Can stress and anxiety cause canker sores? Canker sores can be caused by a number of factors. Stress and anxiety can cause canker sore outbreaks more frequently. Do canker sores come from stress? There is no clear reason why one may develop canker sores. However, high levels of stress may be the reason that you are getting mouth sores. How do you stop canker sores from stress? If you’re experiencing stress sores on your mouth, try reducing your stress levels. This can be done with meditation practices and deep breathing techniques. You can also work on making other lifestyle changes such as reducing your workload at your job. Talk with your dentist or visit a therapist to see what you can do about reducing your stress and preventing canker sores.